The goal of this team is to develop a vibrant and productive research program focusing on discovering novel electronic and optical properties of metallic and semiconductor nanomaterials and their implications for electronics, photonics, energy, and biomedicine. 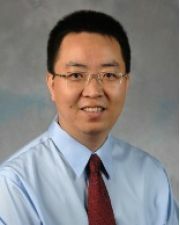 A fundamental understanding of the structure-dependent localized optical properties of nanostructures with sub-10 nm resolution will lead to comprehensive knowledge of the surface plasmon-directed growth of novel anisotropic nanostructures, and design rules for the synthesis and fabrication of hybrid nanostructures with optimized properties for solar energy harvesting, conversion and storage, photocatalysis, and chemical and biological detection. All these projects are high impact and interdisciplinary in nature that combine analytical chemistry, physical chemistry, inorganic chemistry and materials science and engineering. These exciting, multidisciplinary projects will be launched this August. Postdocs, graduate students and undergraduates who are interested in joining our team are more than welcome to contact me at wei@chem.ufl.edu.